Sociedad Estatal Correos y Telégrafos, S.A.
Sociedad Estatal de Correos y Telégrafos, S.A., trading as Correos, is the national postal service of Spain, as recognized by the Universal Postal Union. The company is 100% state owned, through the State Industrial Holding Company (SEPI). With 63,000 employees and 5.4 billion pieces of mail sent each year, Correos is one of the largest postal services in the world. Based in Madrid, it has over 10,000 postal centres all over Spain. The great achievement of the nineteenth century postal matters was the invention of the postage stamp as payment of shipments, now in charge of the sender, because the British Sir Rowland Hill, by putting into service in 1840 and known as the Penny Black. In Spain was implemented on 1 January 1850. It was five the first stamps issued by the government, with face values ranging from 6 quarters for simple letters to 10 real for heavier certificates and all the rendered image was the bust of Queen Elizabeth II. The last step for the final reorganization of mail came in 1889 with the creation of the Body of Postal Workers, organized as a pyramid structure. Coinciding with the reforms of the mid-nineteenth century liberal governments launched the telegraph service. Following the French example, Spain had developed a line drawing of optical telegraphy between 1844 and 1855, for the exclusive use of the State. From that date, was developing the electrotelegráfica network that joined in 1863 and all provincial capitals with Madrid. At the end of the century the number of telegraph offices open to the public amounted to fifteen hundred. This new system revolutionized the world of communications, reducing the time the message a few minutes. Progress throughout the nineteenth century was consolidated during the 20th century with new technologies, new transportation, new services and a strong vocation of public utility caused the widespread use of email. The advent of the automobile and the airplane subsequently changed structures and accelerated postal delivery of correspondence and in 1899 the first post-road driving in the province of Navarra opened, and seven years later the central government in Madrid had already vehicle 16 for transporting the mail. In 1919 was created by decree in Spain the airmail service, which a year later created the first Spanish Airmail lines joining Barcelona Alicante and Málaga, Seville Larache, Barcelona and Palma de Mallorca Malaga Melilla. However, the railway remained the principal means of carrying letters and packages throughout the peninsula until 1993 when the train service gave way to transport by road of the model. 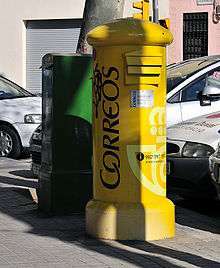 In parallel, Correos has been modernized through an ongoing process to provide new services throughout the century to citizens, such as express mail (1905), the Postal Savings Bank, on delivery reimbursement and Parcel Post (1916), the Postal Express (1981). ↑ "Sociedad Estatal" (in Spanish). correos.es.